Copyright: © 2016 Ghani A, et al. This is an open-access article distributed under the terms of the Creative Commons Attribution License, which permits unrestricted use, distribution, and reproduction in any medium, provided the original author and source are credited. Citrus is one of the most commonly consumed fruits in Pakistan. The present study was conducted to evaluate ascorbic acid concentration in Citrus sinensis and Citrus limetta collected from different tehsils of District Sargodha. All the varieties have good source of vitamin c, but the highest concentration was reported in Citrus sinensis, which was collected from tehsil Sahiwal and that was 89.69 mg/100 mL and lowest reported in Citrus limetta 33.155 mg/100 mL, which was collected from Tehsil Silanwali. Vitamin C, commonly famous as ascorbic acid, which is an important food constituent due to its antioxidant as well as therapeutic activities. It help in formation of collagen (a type of connective tissue) and imparts a key role as an antioxidant that acts as body defense system against reactive oxygen species and free radicals, thus preventing tissue damage and destroy cancer cells and overall improve the health of the body [1,2]. It is generally used in the treatment of many diseases such as scurvy, common cold, anemia, hemorrhagic disorders, wound healing as well as infertility. Animals and humans obtain vitamin C from fruits and vegetables . Citrus fruit and their products are one of the largest source of vitamin C. there are many factors affecting vitamin C concentration in citrus fruits, including production factors, climatic conditions, maturity stage, position of fruit on the tree where it is present on the tree, type of citrus fruit i.e., sweet lemon (Citrus limetta), sweet orange (Citrus sinensis) etc. vitamin C concentration higher when the fruit is immature and declines as the fruit mature. Excessive heat and cold also affects vitamin C concentration in fruits [3,4]. Daily recommendation of vitamin C includes 75 mg/day and for adults it includes 90 mg/day, for children 45 mg/day . A daily dose of 90-100 mg can prevents us from serious diseases like cancer, heart diseases, and cataracts . More than 90% of the vitamin C in our diet comes from food including vegetables, fruits . In animals vitamin C is important in wound healing and preventing bleeding from capillaries . Global production of citrus is reported to be around 120 million tons and generate about 105 billion dollars per year all over the world. The size, color, juice quality and shape vary due to any factor. Seeds of citrus vary in color from greenish to pale whitish and size of flowers vary from 2-4 cm, calyx contain 4-5 lobes, generally five petals and contain some oil glands. Size of leaves vary from 2-8 cm, dark green in color. Medical uses of orange include Anti-oxidant property, Protection against Cardiovascular Diseases, anti-carcinogenic property, reduce the risk of kidney stones, anti-ulcer property, anti-anxiety, antityphoid, anti-bacterial, larvicidal, anti-diabetic, anti-fungal, antiinflammatory, healing, anti-arthritic activity. Other medical use of citrus include arthritis, asthma, alzheimer’s disease, parkinson’s disease, muscular degeneration, diabetes, gallstones, multiple sclerosis, cholera, gingivitis, optimal lung function, cataracts, ulcerative colitis, crohn’s disease, help to citrus plant including fruits, leaves, flowers, peels and juice are used as in homeopathic (Desi) medicines and people prefer these medicines because these are long term effective and not too much expensive. Overall citrus contain Vitamin B1, B2, B3, B5, B6, A, C, Flavonoids, terpenes, potassium and calcium . Traditional uses of citrus include its juice help to eliminate toxins from the body, maintain hydration, general tonic, anxiety disorder, stress, treatment of tuberculosis, cough, cold, respiratory problems, in the treatment of obesity, innocence, fertility, angina, hypertension, constipation, diarrhea, menstrual disorder, palpitation. Citrus fruits can be stored at on room temperature for 2-3 days but in refrigerator stored up to 14 days [8,9]. The different Tehsils of District Sargodha were selected for the purpose of sample collection. Fruits of two citrus varieties (Citrus sinensis, Citrus limetta) were collected from different Tehsils (Bhehra, Silanwali, Sargodha city and Sahiwal) for analysis (Tables 1-4). Each sample comprised of three replicates. Each sample was randomly handpicked, wrapped in a specific brown envelop and labeled (Figures 1-4). Table 1: Variation in Bhehra samples. Table 2: Variation in Silanwali samples. Table 3: Variation in Sargodha city Samples. Table 4: Variation in Sahiwal Samples. 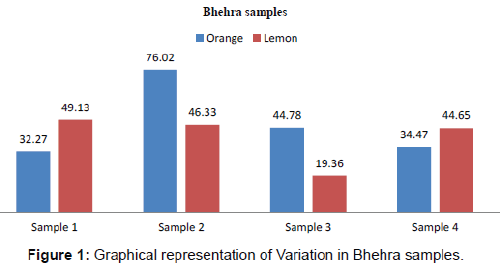 Figure 1: Graphical representation of Variation in Bhehra samples. 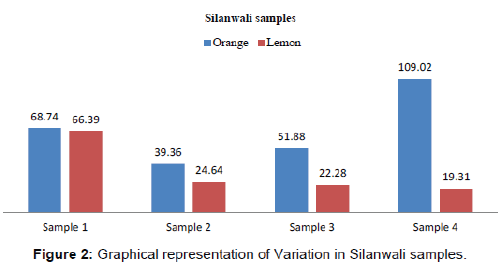 Figure 2: Graphical representation of Variation in Silanwali samples. 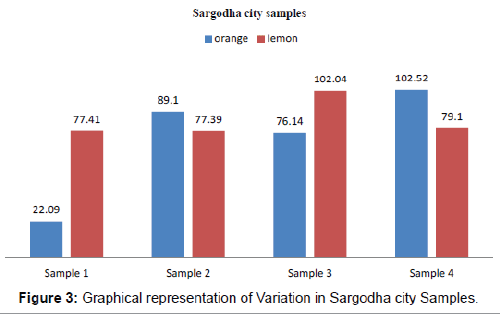 Figure 3: Graphical representation of Variation in Sargodha city Samples. Figure 4: Graphical representation of Variation in Sahiwal Samples. Chemicals: The chemicals used for the experimental purpose in the experiment includes distilled water, potassium iodide 5 grams, potassium iodate 0.268 grams, conc. Sulphuric acid 30 mL, 1% starch solution, standard ascorbic acid 0.25 grams. Sample preparation: The fruits were blended with a blender each and was filtered by using muslin cloth and made up to 100 mL with distilled water. First of all Starch indicator (1%) was prepared, adding 0.50 g starch to 50 mL of distilled water. Iodine solution was prepared by mixing 5.00 g potassium iodide and 0.268 g potassium iodate was dissolved into 500 mL beaker with 200 mL of distilled water. 30 mL of 3 molar sulfuric acid was added into beaker and then diluted with distilled water until 500 mL solution. Vitamin C standard Solution was prepared by dissolving 0.250 g ascorbic acid in the beaker with 100 mL of distilled water. The solution was transferred into 250 mL volumetric flask and diluted to 250 mL with distilled water. Ascorbic acid content in two varieties of citrus fruit Varied significantly by all selected tehsils of District Sargodha. Ascorbic acid concentration in sweet orange variety in various tehsils was 89.6975- 46.885 mg/100 mL. The highest ascorbic acid concentration of sweet orange was observed in tehsil Sahiwal 89.6975 mg/100 mL and lowest concentration was observed in Bhehra which was 46.885 mg/100 mL. While ascorbic acid concentration in Sweet lemon collected from different tehsils of Sargodha was 83.985-33.155 mg/100 mL. The Highest Ascorbic acid concentration in sweet lemon was observed also in Sargodha city and that was 83.985 mg/100 mL and on the other side the lowest concentration of ascorbic acid was observed in Silanwali and that was 33.155 mg/100 mL (Figure 5; Table 5). 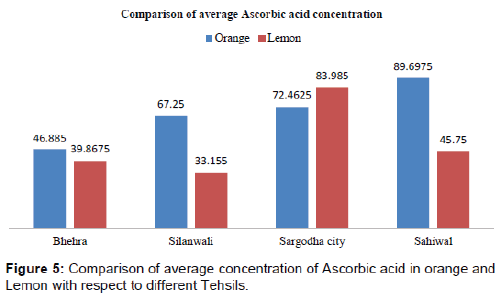 Figure 5: Comparison of average concentration of Ascorbic acid in orange and Lemon with respect to different Tehsils. Table 5: Comparison of average concentration of Ascorbic acid in orange and Lemon with respect to different Tehsils. Fluctuation in ascorbic acid concentration in both varieties, collected from different Localities may be due to environmental factors (soil composition, water, temperature, light, etc.) or due to special variation. 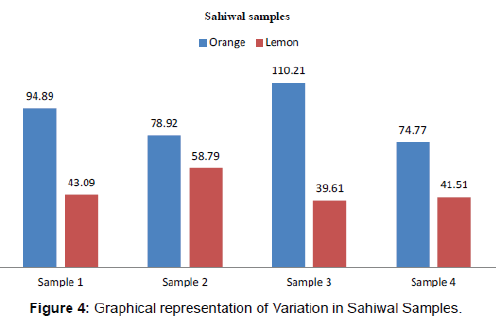 like lemon and sweet orange from Bhehra, Silanwali, Sargodha city, Sahiwal but overall the highest concentration (89.6975 mg/100 mL) of ascorbic acid was observed in Tehsil Sahiwal orange while the lowest concentration (46.885 mg/100 mL) of ascorbic acid in Tehsil Bhehra orange. And overall the highest concentration of ascorbic acid in lemon of Sargodha city was observed (83.985 mg/100 mL) and the lowest concentration of ascorbic acid was found in lemon Tehsil Silanwali i.e., (33.155 mg/100 mL). Difference in random samples vary a lot due to some environmental factors, soil, height of fruit from ground or at the top and samples were taken from different citrus orchids even in a single tehsil. We are thankful to Dr. Nadeem and institute of food sciences and nutrition for providing research facilities for this study. Okiei W, Ogunles M, Azeez L, Obakachi V, Osunsanmi M, et al. (2009) The Voltammetric and Titrimetric Determination of Ascorbic Acid Levels in Tropical Fruit Samples. International Journal of Electrochemical Science 4: 276-287. Hickey S, Roberts H (2013) Vitamin C and Cancer: Is there a use for oral Vitamin C. Journal of Orthomolecular Medicine 28: 33-44. Nagy S (1980) Vitamin C contents of citrus fruit and their products: a review. Journal of Agric Food Chem 28: 8-18. Ezeigbo OR, Okike OFU, Agomoh NG, Anosike EO, Asogu GO (2013) Determination of relative levels of Vitamin C in different Citrus fruits cultivated in Nigeria. The International Journal of Science & Technology 1: 6-8. Deekshika B, Praveena LB, Singuluri H, Sukumaran MK (2015) Eztimation of ascorbic acid content in fruits & vegetables from Hyderabad India- A theoretical assessment of Vitamin C activity. International Journal of Current Microbiology and Applied Sciences 4: 96-99. Huma T, Mengal F, Masood Z, Mengal R, Ahmad S, et al. (2015) Determination of Vitamin C content in citrus fruits and in Non- Citrus fruits by Titrimetric method, with special reference to their nutritional importance in human diet. Biological forum – An International Journal 7: 367-369. Etebu E, Nwauzoma AB (2014) A review on sweet orange (Citrus sinensis L osbeck): health, diseases and management. American Journal of research communication 2: 33-70. Milind P, Dev C (2012) Orange: range of benefits. International Research Journal of Pharmacy 3: 59-63. Nisha SN, Swedha AA, Rahaman JSN (2013) Antibacterial activity of Citrus sinensis peel against enteric pathogens. International Journal of pharmaceutical research and Bio-science 2: 1-13. In the presented research study authors compared to evaluate ascorbic acid concentration in Citrus sinensis and Citrus limetta collected from different tehsils of District Sargodha. The document is a significant addition to the scientific literature in this field.